VIP is in the lower level of Block Six at 624 Main Avenue in downtown Fargo. From I-94: Take exit 351 (highway 81/University Dr) turning north onto University Drive and continuing to 13th Avenue South. Turn right (east) for six blocks. At 7th Street South, turn left (north) for 13 blocks to Main Avenue. VIP is in the lower level of Block Six at 624 Main Avenue (just east of 7th Avenue South). 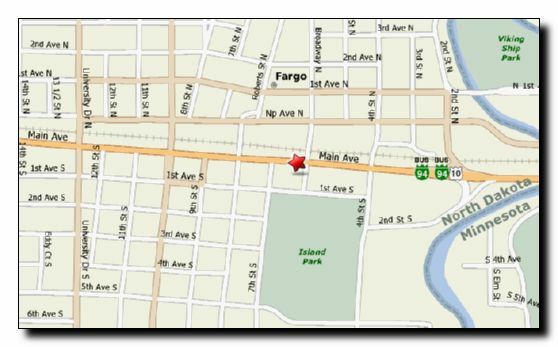 From I-29: Take exit 85 onto Main Avenue, turn east and continue approximately 2.5 miles to 624 Main Avenue in downtown Fargo. VIP does NOT have its own parking lot, but there is usually generous parking on the streets in the area. Fargo does not have a parking meters but most of the free parking spaces are for 90 minutes to 2 hours from 8 a.m. to 5 p.m. weekdays.